Stevie Wonder mastered Motown's distinctive fusion of pop and soul and went on to compose far more idiosyncratic music, an ambitious hybrid of sophisticated Tin Pan Alley chord changes an R&B energy, infected with jazz, reggae, and African Rhythms. The second son of Calvin and Lula Mae Judkins, Steveland Morris was born May 13, 1950 in Saginaw, Michigan. At various times Wonder's surname can be founded as Judkins, Hardaway or Morris. Though Morris appears on his birth certificate, it never has been properly explained who Morris was. It has been speculated that Morris was an old family name. Lula Mae's was a daughter of an unwed mother. She was abandoned before her birth by her father Noble Hardaway. Two weeks later in the winter of 1943, she was sent to East Chicago, Indiana where she was raised by her aunt and uncle, Henry and Virgie Wright. Ironically in 1948 she became pregnant by a man named Paul Hardaway. The result was a baby who she named Milton. After the death Henry, Virgie and death of their son John, she was sent to live with her father Noble. When that didn't work out she was sent to Chicago, Illinois to live with her aunt and uncle. Ironically in 1948 she became pregnant by a man named Paul Hardaway. The result was baby that she named Milton. At this time she was sent to live with a relative in Saginaw, MI. There she met a chronically unemployed, street hustler, gambler, drunk named Calvin Judkins whom she became pregnant by. By mid-1949 came the birth of her second son, Calvin Judkins Jr. While in Saginaw Calvin would take a job in a furniture store, one that didn't last long. Soon he was back to his old ways. Late in 1949, Lula became pregnant with Stevie. A troubled pregnancy, Stevie was born two months premature. Though the doctors didn't know it, Stevie lost his vision mere hours after birth. It seems that after being placed in an incubator, given too much oxygen, that caused permanent sight loss. This condition is known as retin-opathy of prematurity. He was the incubator for forty days before being taken home on the fifty-fourth day. In the spring of 1953 the family moved to Detroit and into 2701 Hastings, a three bed-room flat in the Brewster-Douglas projects. In order top pay the $100 rent, Lula worked at a local fish market. There she would work from midnight to dawn, then overtime to mid-afternoon.. They would move to three bedroom flat on Horton Street. At this time Stevie began Bagley Elementary School which had special classes for blind students. The Judkins were a musical family. Calvin, a frustrated musician, would teach Stevie songs, buy him a cheap set of bongos, plastic harmonica and and toy piano. Lula always had the radio on to WCHB the first Black owned radio station.. in the United States. A neighbor woman at 2701 Hastings had a piano she allowed Stevie to use. A barber on the block gave him Hohner harmonica. The local Lions Club at a Christmas party for blind children gave him a drum set. Playing the harmonica at five, he started piano lessons at six and took up the drums at eight. Lula Mae was afraid to let the young boy out of house. Thus a brilliant musical career was launched. To pass the time of day, Wonder would beat on pot, pans,and any other surface that helped him keep rhythm with the tunes he heard on the radio. As he became proficient on various real instruments, he started playing and singing in the choir at the White Stone Baptist Church every Sunday. Kim Weston would claim that the church was actually New Corinthian Baptist. Stevie soon grew to be something of a neighborhood sensation. When Stevie turned ten, the family moved to bought a modest four bedroom house at 3347 Breckenridge for $8000 with a $800 down payment. There he began attending attending the Fitzgerald School for the Blind where he learned and mastered Braille. During this time he had meet a neighborhood kid name John Glover, a son of one Lula's friend Ruth. Glover who played the guitar with Wonder on the harmonic, formed a trio calling themselves Stevie and John. It just so happened that Glover's cousin, Ronnie White was one of Smokey Robinson's Miracles. In June, 1961 Glover made arrangements to meet at White's house to play a few songs for him. When they arrived not only was White there, but fellow Miracle Bobby Rogers too. They played Lonely Boy, a song Stevie had written, with Stevie singing and Glover accompanying on acoustic guitar. Auditions at Motown worked that you usually had go to a lower level or two before one got to see Gordy. There are several difference versions of who were took and were involved in arranging Stevie's arranging initial audition. One was White took Stevie and John to Motown the next day. September 23, 1961, along with Lula and Milton Hardaway. White first took him to Brian Holland. Another was an impressed Holland that sent him to Mickey Stevenson Motown's A& R man. Another as Stevenson remembers it, was Clarence Paul his assistant that brought him in. Janie Bradford attests to that too saying " Stevie was out on the front lawn with his mother and Clarence Paul. That was before he signed with Motown, before he ever auditioned. I'm sure Clarence was in position to bring Stevie in." Stevenson brought him to Gordy where he sang, played the bongos and harmonica. Gordy envisioning another Ray Charles offered him a contract. Now we are told again two different stories. The first was that Lula Mae, turned off by Mickey Stevenson, claimed he tried to rush her into signing the standard five year contract. Her real objection to the contract was the small salary salary, Motown's normally paid it's performers $200 a week. If under twenty-one an even a less formal $200 a month out of Gordy's pocket. However the biggest reason was under aged Stevie's royalties due would be held in a trust controlled by Motown until he turned twenty-one. Lula Mae left leaving the contract unsigned. Stevenson claimed that she was upset that contract wasn't ready fast enough. For whatever reason Lula returned and after agreeing to a have a $200 monthly salary, this amount would not increase until the mid-60s, paid directly to her, Lula signed the contract. Stevie signed his X under the typed-in name of Steveland Morris. It has been reasoned that it was to put a legal wall should Calvin Sr. ever try to claim any of Stevie's future earnings. There are multiple versions of how Stevie got the stage name Stevie Wonder. The first was Gordy after seeing Steve perform one day in the studio exclaimed "That boy is a wonder" and the name stuck Another version is that one day Paul was talking with Stevenson. Stevenson: We can't keep calling him the eighth wonder of the world. Paul: How about Stevie Wonder? Stevenson: Why don't we call him "The Wonder Kid." Paul: Wonder Boy? Stevenson: There's already a Wonder Boy and Batman got him. Paul: Stevie the Wonder Boy. Stevenson: Sounds like a circus act. Paul: Maybe we should keep calling him little Stevie Stevenson: How about Little Stevie Wonder? 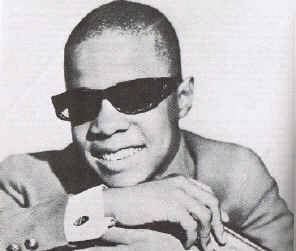 His first album, Little Stevie Wonder the 12 Year Old Genius made the child a huge star, and gave Stevie a number one hit with single "Fingertips," #1 pop and R&B hit. The following year he enrolled in the Michigan School for the Blind where he studied classical piano. During the childhood stage of his career, Stevie amazed audiences with his exciting performances and continued hitting the charts with such singles as "Hey Harmonica Man," "Work Out Stevie, Work Out," and "Contract On Love" to name a few. In 1964 Wonder dropped the "Little" appellation. His late teen years saw continued success with "Uptight (Everything's Alright)," " For Once in My Life," "My Cherie Amour," and "Signed, Sealed, Delivered I'm Yours." Throughout this period Stevie worked on improving his skills as a singer, keyboardist, songwriter, and producer. In fact, he co-wrote most of his singles from 1967 onward, as well as the Smokey Robinson hit "The Tears of a Clown". On both his records and live shows he was featured playing harmonica, drums, piano, and organ as well a singing - sometimes all in one number. During his first three years he was presented as a screamer in the Ray Charles mold. In 1964 he appeared on screen in Muscle Beach Party and Bikini Beach. His Up-Tight album included "I Was Born to Love her", "For Once in My Life", and Shoo-Be-Doo-Be Doo-Da-Day". Wonder's style broadened to include Bob Dylan's "Blowing in the Wind" "A Place in the Sun," and an instrumental version of Burt Bacharach's "Alfie". In 1969 he had hits with ballads "My Cherie Amour" and "Yester-Me, Yester-You, and Yesterday". Once Stevie turned the age of 21 in 1971, he didn't immediately resign with Motown. Now able to draw funds from his trust fund, he invested in his own publishing (Black Bull Music) and recording studio, Taurus Productions, ( where he could finance his own recordings. Stevie also took some music theory classes at USC to improve his song writing capabilities. Stevie recorded two albums on his own ( Where I'm Coming From and Music of My Mind) with the programming aid of Robert Margouleff and Malcolm Cecil. Margouleff and Cecil helped Stevie pioneer the use of synthesizers in popular music (most notably in Music of My Mind.) With these two albums, Stevie negotiated a contract with Motown that allowed him more freedom in artistic matters and a higher royalty percentage. Stevie signed for five years with $1 million given as an advance against future royalties, complete control over what he recorded, won back half of the publishing royalties of all previous work as well as future work, in addition to 12% on royalties from sales. However Gordy would retain control of the single releases. Such a contract was nearly unheard of then, since Motown had a reputation of being merely a hit-making machine with little variety. Once the new contract was signed, Stevie released the two albums. Although the albums were not huge successes, Stevie showed signs of the genius that was about to come. By the time of "Signed, Sealed, Delivered," he was serving as his own producer and arranger, playing most of the instruments and writing material with his wife Syreeta Wright. During this time he had hits with "Signed, Sealed, Delivered I'm Yours", Heaven Help Us All', and "If You Really Love Me". His singles upheld Motown's tradition of hook happy radio fare, but distinguished themselves with socially conscious subjects such as ghetto hardship and political disenfranchisement. His albums, beginning with Music on My Mind, on which he played most of the instruments, were devoted to his more exotic musical ideas. .In late 1972 Stevie began his string of critically acclaimed and Grammy winning albums with Talking Book. This album brought Stevie out from the mini-slump he had been suffering through chart-wise with two number one hits, the funky "Superstition" and the now standard "You are the Sunshine of My Life." The album was a big hit with the public. The power and emotion of the album in many ways shone true because many of the songs ("Blame It on the Sun," " Looking For a New Love," " I Believe") were written in reference to the relationship with his wife and former musical partner Syretta Wright. The programming of Margouleff and Cecil helped to represent these feelings in an all new manner. Less than a year later Stevie released the now classic Innervisions featuring the hits "Living For the City" and "Higher Ground." The former Living is perhaps the most dramatic and inspiring song Stevie has ever written. This song, along with many Marvin Gaye classics from What's Going On helped soul music adequately face and question the prevailing racial problems and inadequacies. Higher Ground (maybe the best Red Hot Chili Pepper funk-out) along with Jesus Children of America allowed Stevie to express his spirituality and love for God unlike ever before. The album was full of other powerful tunes like "Too High" and "He's Mistra Know-It-All" which are about drug abuse and gangsters/players, respectively. Innervisions is regarded by many as the high mark of Stevie's craft; it was the album he was meant to make for the world. His next album, Fulfillingness' First Finale (1974) expressed this new sense of life musically. The album did have its share of variety, such as the anti-Nixon funk anthem You Haven't Done Nothin' and the happy Boogie on Reggae Woman. However, the album was on the whole more introspective and life-affirming than his previous albums. Throughout this period, Stevie Wonder nearly swept all possible Grammys he was eligible for. Winning for Best R & B Artist, Best Album, Best Song, Best Male Vocal, etc., Stevie amassed numerous awards and was recently awarded the Grammy's Lifetime Achievement Award. While in-between albums in 1976, Paul Simon in his acceptance speech for winning the Album of the Year Grammy jokingly thanked Stevie Wonder for not releasing an album that year. Stevie in fact did not release an album during that period because he was working on what would be his masterpiece double album entitled Songs in the Key of Life, released in 1976. This album runs the gamut of different musical styles, from the baroque classical in "Village Ghetto Land" to the gospel soul of "As," the fusion jazz of "Contusion" to the Middle-East influenced "Pastime Paradise," and the boogie-woogie jazz of "Sir Duke" to the all-out funk of "I Wish." Lyrical content also varied, covering such wide topics as racism & Black History ("Pastime Paradise,' " Black Man"), the passing of time ("I Wish, Summer Soft), child adoration (Isn't She Lovely), and of course love (As, Knocks Me Off My Feet.) If any Wonder album is a classic, it is Songs.